About a year ago, I received a very lengthy comment to my blog's Facebook page, calling me out for writing "harsh and critical" reviews. (The specific review that prompted the comment has since been moved to Goodreads.) After I responded, the commenter deleted the entire thread (including her last reply, which I never got to read!) Though the comment has disappeared into the ether, it has stuck with me because of the way it assumed all critical reviews are harsh. A critical review, according to the definition I have always used, is an objective assessment of the merits of a particular book. It is neither unduly complimentary nor gratuitously mean. It simply takes stock of the text (and illustrations, if applicable) and honestly describes for its audience what works and what doesn't. This does not mean the review consists only of criticisms of problems; rather, the review provides sufficient information about the book's strengths and weaknesses to help the reader decide whether it suits his needs. This is the type of review I strive to write. Today, as Armchair Book Expo focuses on best practices in the online book community, I want to share my best practices for writing critical reviews, which I hope will explain how I see my role as a book reviewer and dispel the myth that to be critical is to be cruel. My first piece of advice for writing an effective critical review is to critique the writing, not the writer. Though sometimes books make us feel connected to their creators, the fact is that authors are completely separate from their books. Your comments about the quality of a particular book should be confined to discussion of the book's merits and should not delve into an author's personal life. There is no need to speculate about an author's life experience, to insult his intelligence, or to wish that serious harm would befall him. Instead, consider the elements that make up a good story - characterization, plot, and setting - and the author's use of literary devices in developing these elements. By focusing solely on the text of the work in question, you eliminate any chance of the author taking your review personally, and you present yourself as a thoughtful critic of literature and not as a careless reader with a chip on her shoulder. On a related note, in critical reviews, you should write about the book, not about yourself. The commenter I mentioned in the introduction to this post spent a lot of words telling me that all she really wanted to know was how a book made me feel. Then she waxed poetic about how I needed to "read like a child....voraciously" and to focus more on the pleasure of reading than "the fact that there was a typo on page 12." The problem with writing reviews that focus on your own feelings, however, is that they tell the reader more about you as a person than the book itself. Of course, books (both good and bad) elicit strong responses from reviewers. What is valuable in a book review, though, is the qualities of the text that bring out these strong emotions, not a lengthy description of the emotions themselves. In the same way, it is important not to allow personal biases to influence your book review. Writing something like, "I teach fourth grade, and this book is not for fourth graders, and therefore I can't recommend it" only tells the reader of your review why the book does not suit your unique purposes; it tells him nothing about how it might suit his own needs. Another way to ensure that you are writing a respectful, critical review rather than a harsh one, is to use the text to support your criticisms of the book. Whatever the problems in a book - historical anachronisms, flat characters, awkward sentence structures, poor use of rhyme, etc. 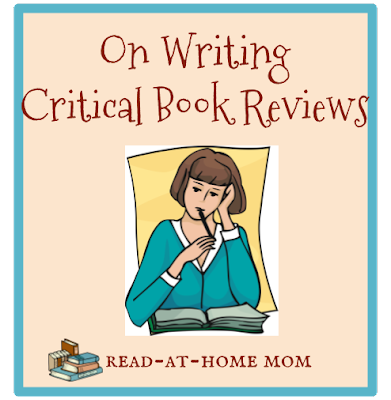 - the critical book reviewer should be able to explain them by pointing to the paragraphs where the problems occur. Instead of making sweeping generalizations about a book based on your overall impressions, look through the text to find examples of the things you find troubling. Sometimes, seeking out these citations makes you realize that the problem you thought you had encountered was not as prevalent as you imagined; in other situations, looking through the book for evidence of a problem you noted helps you uncover a larger pattern that warrants coverage in your review. But just as you could not condemn a criminal defendant without sufficient evidence, neither does the critical book review simply slam a book for its failings without backing the comments up with textual support. Finally, it is important that that you use a professional tone when you write a critical review. The most insightful comments about a book can easily be overlooked when a book review is fraught with foul language and sexual innuendo. While it can be disappointing to spend time reading a book you didn't enjoy, a critical review is about calmly, fairly, and objectively figuring out why a book does or does not work well, and not about venting your frustrations and anger about having spent time on a book that wasn't worthy. It's perfectly acceptable to dislike a book, but if you want to write a review warning others away from it, it's best to make clear arguments to that effect and to avoid appearing as though you are ranting or throwing a tantrum. I think this is all good advice. A lot of people don't want to write critical reviews, which is certainly their own choice. But I do think that in writing them, you provide a service to readers. I find the toughest critical reviews to write are where you know the author in some way. This means that the longer I blog, the harder it gets to write any critical reviews :-). Great advice here, this is how you write a professional review without having to have loved the book. This is such a great post! It really fits right into what I was mentioning in my Armchair BEA Intro post about losing a friend over a critical review of her book. The sad thing is that I gave her a 3 star review. And I've never given her anything less than that. I did comment on the issues with editing, etc., and I think that's what she disliked. I gave her a lot of compliments about the story and characters for the most part. This is part of the reason I rarely give negative reviews anymore. In fact, I'm to the point if I don't like a book, I really don't even finish it, because I know that I don't want to waste the time. Like Jen's comment above, it is hard to write critical reviews of people you know especially. Thanks so much for sharing this! Sage advice. I do sometimes write about myself — but usually on reviews that aren't critical because I'm too wrapped up in enjoying the book to write that type of a review. This is great advice. It baffles me why someone would get angry about someone else writing critical reviews. If you want a review about, as that commenter said, how a book made a reviewer feel, then surely you can find that review written by someone else. There's no need to get angry that someone else wrote they review they wanted to write as opposed to what you wanted to read.